Ryan expertly weaves dialogue and description in this continuing story of a woman and her obsession with an ancestral home. Dot Ryan once again proves her abilities as an engaging storyteller, maintaining the high caliber of writing showcased in her award-winning debut, Corrigans’ Pool (2011), with its sequel, No Place for Naked Dowsers. The fast-paced novel never loses steam, and delivers a compelling and wide-ranging story involving the dangers inherent in a changing land and population, forgiveness, and overcoming tragedy. Ella Garland’s Georgia plantation has been her focus for years. Her devotion to her ancestral home led her to sacrifice a great deal in Corrigans’ Pool, and she believed she was well on her way to a comfortable future with her husband and son at Greenpoole Plantation. She soon discovers her struggles are far from over, and her steadfast commitment to preserve the way of life she’s always known threatens to destroy her family. Faced with her husband’s growing resentment and exasperation, Ella is forced to choose between saving the home she fought so hard for or her marriage. When Ella’s husband, Gentry, decides he’s had enough, he takes drastic measures to try to get Ella to see things his way, resulting in their eventual transfer to his Texas home. Ella’s determination to reject all he gives her and get back to her beloved Greenpoole leaves Gentry increasingly distant. While he works hard to make their new situation bearable for his wife, Ella continues her quest to get back “home” to Georgia—with or without him. 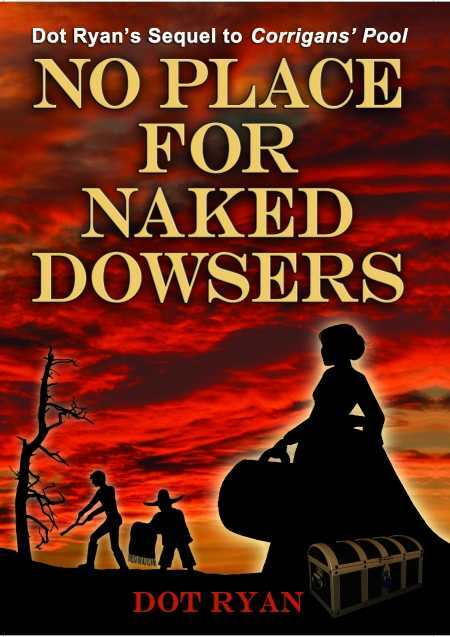 Ryan sustains a strong narrative throughout No Place for Naked Dowsers, easily maintaining reader interest as she expertly creates a solid sense of both time and place. Dialogue and description weave together to successfully lure readers into the story, and events unfold at a comfortable pace. The author shines brightest in her vibrant characterizations. While this sequel can stand alone, enough members of the Corrigans’ Pool cast remain to satisfy that audience. Ryan effectively depicts their continuing stories while introducing several new and interesting characters. Among these is Hempstead Grouse, whose surname aptly describes his manner of constant grumbling, and whose irascible and foul-mouthed presence grates on Ella as much as the drought-stricken Texas land itself. Hempstead’s habitual bickering with Ella’s old companion, Tessie, provides an amusing shift in tone whenever the two are together. While Gentry’s character remains steady, Ella’s personality changes as her admirable devotion to her home becomes a troubling obsession. Ella’s desperation—and the uncharacteristically egocentric actions that it leads to—occasionally makes it difficult to reconcile her self-absorbed character with the compassionate, kindhearted young woman introduced in the first book. New readers may find themselves feeling sorry for Gentry, and wondering how he can remain so devoted to a woman who seems to care little for him. Although Ella eventually redeems herself, the character transformation comes late and rather hastily. While Ella may be brought to an extreme in this sequel, her struggles effectively demonstrate the challenge of learning to move on, of realizing that memories of loved ones live in the heart rather than in the land on which they lived. Ella almost loses herself along with what’s most important to her, and finding her way to the truth in her own heart nearly proves her undoing. Ryan’s talented writing ensures readers will be invested in the outcome of her heroine’s journey. A worthy read.